So, I recently went shopping to a mall that is a little farther away from my house. But this mall has more high end stores which is always nice right? Money in hand My friend and I started browsing around Nordstrom. However, I am holding out on any Nordstrom purchases till the Nordstrom Anniversary Sale. I will defiantly be doing a post on it and what I purchased. There are many sales going on in stores at the moment as they transition from Summer to Fall clothing and accessories. The first purchases I made were from Forever 21. I struck out quite a bit in the dressing room this go around. As many people know Forever 21 is a real hit or miss store. Usually I have an abundance of choices but I only walked away with one skirt. But, I am very excited about it. I feel like this skirt would work into fall and winter. I plan on styling it with different colored tights, boots, and sweaters. I am going to do a lookbook on how I style a simple skirt like this from summer into fall/winter. At around 12 dollars I couldn't leave it. 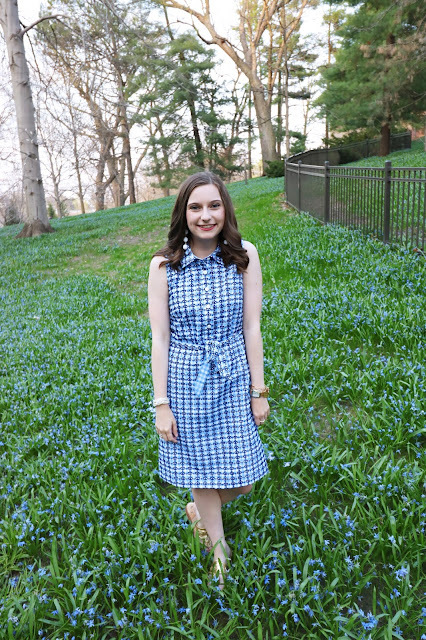 The skirt is tight at the waist then flares out and is super cute and flirty. 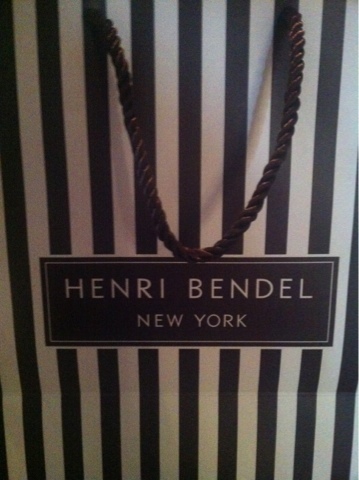 Henri Bendel had a summer sale and a lot of their jewelry was 40% off. 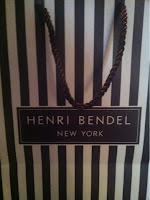 Which is completely amazing because I have never ever seen a sale are Henri Bendel! So, trying my best to restrain myself I picked up two new pieces with rose gold accents. 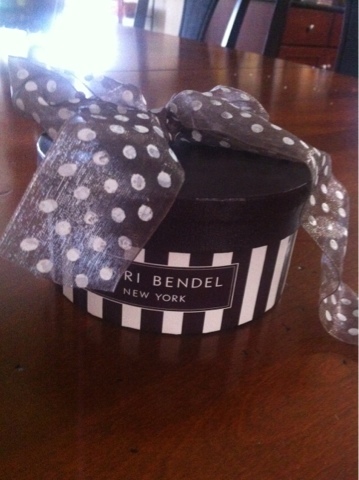 The first bracelet is a wrap bracelet with a belt like buckle clasp. Also, they have rose gold tripped stones. A small detail I love in this bracelet is the signature stripe on the inside. The second piece I picked up was something I have been eyeing for a while. It is a stretchy bracelet with white, glass, and rose gold beads. 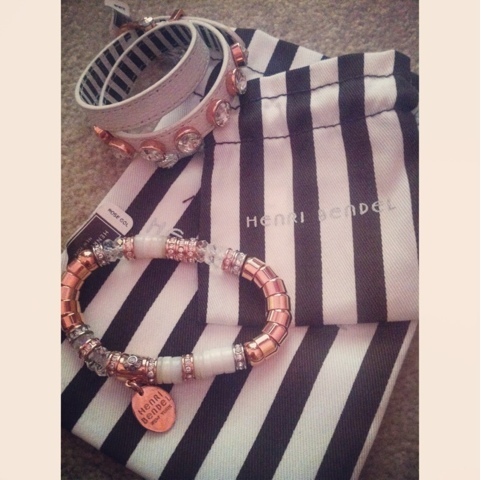 I am completely obsessed with it and it goes perfectly with my other rose gold bracelets. 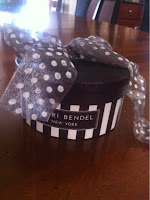 In addition, it is a really good stacking piece to have for your arm candy. 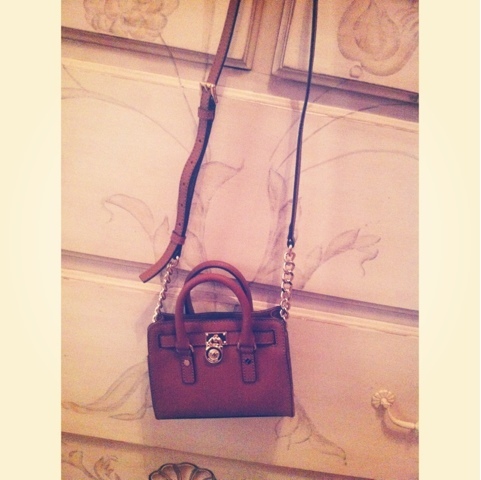 My friend (my shopping buddy for the day) actually showed me this purse on Michael Kors's Instagram. Of course we both oo-ed and ahh-ed it and were dying to buy it. I looked EVERYWHERE online and it is sold out practically everywhere. So, our goal of the day was to try and find it. We browsed Nordstrom to try and find it but it was a bust. Luckily they have a Michael Kors store in the mall. As we walked past we scanned the store to find the tiny Mini Hamilton tote in the way back of the store. I freaked out at the tiny adorable little bag and I knew I had to get it. I warn everyone about this purse because it is UBER tiny. However, I don't carry a lot of stuff with me and I think this will help me not overload. Also, in college I want a tiny yet fashionable bag to carry the essentials that I need. 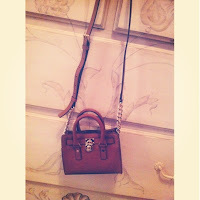 So, if you were eyeing this bag check a Michael Kors store if your department store doesn't have it!